While planning an event at our church themed around butterflies, I got to wondering where in the world is the largest butterfly? A quick search came up with the results. In Papua New Guinea there is a butterfly called Queen Alexandra's Birdwing and its wingspan measures eleven inches. Equally as large though is the Goliath Birdwing in Indonesia. Closer to home, the largest butterfly in the United States is the Giant Swallowtail whose wingspan is 4-6 inches. On the other end of the scale is the smallest butterfly in the world found in Africa called the Western Pygmy Blue. At a half inch wingspan I'm surprised anyone would actually see it. Another question that came to mind was how to tell the difference between a moth and a butterfly. They come from the same general family but there are some differences. A butterfly has antenna with rounded clubs on the ends as opposed to a moth who had thin antenna that are sometimes feathery. 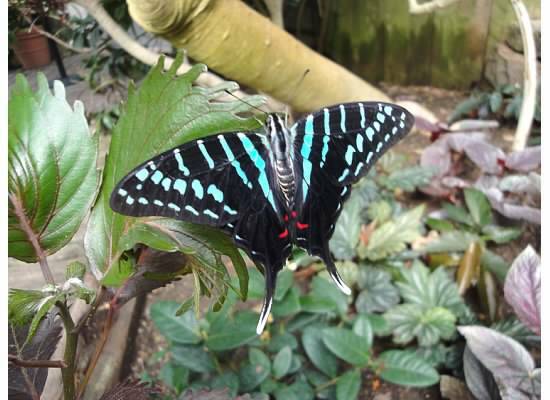 A butterfly's body is thin and smooth and a moth is usually thick and fuzzy. Butterflies are active during the day and moths at night although I don't think that's always the case. Butterflies are more colorful but when you see the Luna Moth, you'll see that there are exceptions to the rule. Whatever the size, whatever the shape, butterflies and moths bring a bit of joy and fantasy into our world.